If you want to view an existing report, select Reports Menu > Generated Reports where the selected View Option is changed to My Reports and the content archive tree is modified to display all generated reports. 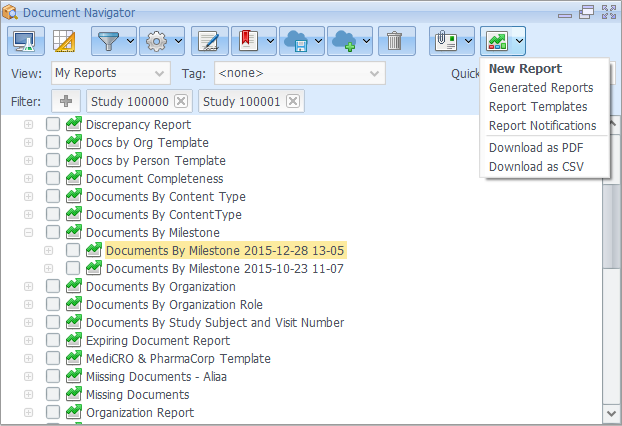 To view and manage existing user and organization report templates, select Reports Menu > Report Templates. The Report Templates Manager dialog pops up and shows by default Organization and User templates. You can select to view only one template type by deselecting the other template type. 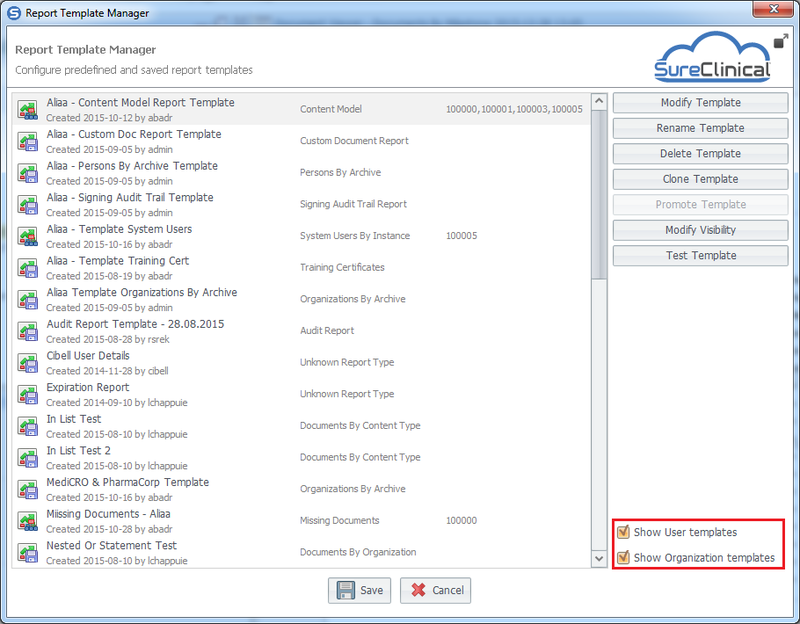 Report Template Manager allows promoting user template to organization template. You can do so by selecting user template then click on Promote Template and select studies you wish to have access to the selected template and click Save. You can also clone, modify, delete, or rename templates through this dialog. Finally, you can change the visibility of a template for studies (after promoting it to remove or add more studies) by clicking on Modify Visibility. To set automated report generation and send the generated reports via email periodically, select Report Menu > Report Notifications. User Profile dialog pops up with Notifications tab displayed (you can also access this dialog via main menu, Settings > User Profile). All report notifications are listed at the bottom. You can add a new report notification by clicking on the Add button. The Report Notification dialog pops up where you add the report notification name, select the report template used in generating the periodic report, frequency in sending the generated reports, the start date/time, and the setting to turn on/off this report notification (turned on by default). Fill all the necessary details and click Save. The notification is added to the list where you can modify or delete it.